I sometimes ask people whether they want to join me on a trip, but usually no one wants to come. I was therefore very happy when my friend T. agreed to accompany me on a trip to Great Yarmouth in May. The plan was as follows: First we take the train to Norwich, then change to the Yarmouth-train to get off at Berney Arms, a tiny railway station that is known for being in the middle of nowhere. 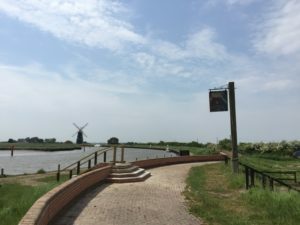 Then we would walk from Berney Arms to Great Yarmouth, through the Norfolk Broads along the river Yare, and have a nice time at the seaside. And that is precisely what we did. The journey to Norwich went smoothly, and we caught the required train. 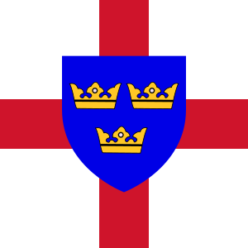 There are two railway lines to Great Yarmouth, and Berney Arms is on the one which is less frequently used, so it was important to get this particular connection. It is also a request stop, so the conductor had to be informed about our wish to disembark. 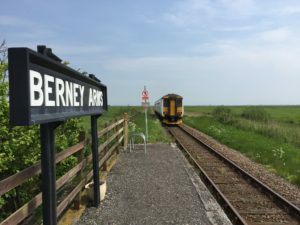 Although our train was by no means very long – only two carriages – the platform at Berney Arms is so short that only the very first door can be used! A surprisingly large crowd got out there as well, about 5-6 people. Even T., who is not exactly a railway enthusiast, was duly impressed by the smallness and remoteness of the station, and pictures were taken accordingly. The footpath from the station leads to a windmill, and there also used to be a pub called Berney Arms. Unfortunately that has been closed for a few years; in this video the previous owners are interviewed, which amazingly moved there from Birmingham. Since going to a pub is more appropriate at the end of a walk rather than its beginning, the closure of the pub was no great inconvenience to us though. T. and I made out way towards Great Yarmouth along the Wherryman’s Way, which is a distance of about 6 miles. (If you walk into the other direction you get to Reedham, which has a swinging bridge). 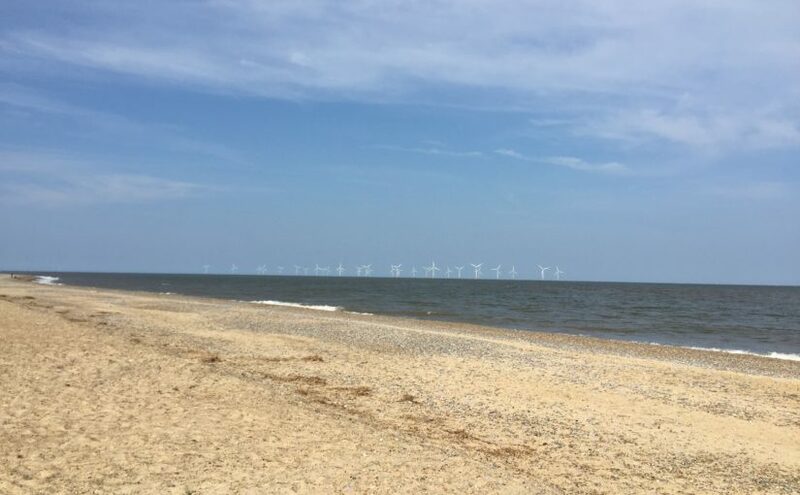 The terrain is Norfolk at its finest and flattest, we could see the windmill we started at until the very end of the walk. Since we were close to the sea it was also quite breezy, and given that there were no hills or trees T., whose ears are sensitive to cold wind, suffered a bit. This could easily have been prevented by the presence of a cap or a hat, but neither of us had brought one. It is astonishing how noisy these locomotives are; the sound could leads one to believe that an invisible helicopter is starting somewhere! (This is captured well here). 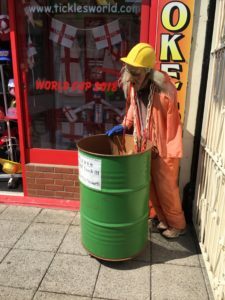 After arriving in Great Yarmouth we looked for some well-deserved lunch. 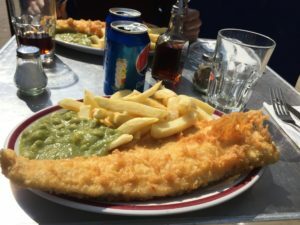 We opted for fish and chips, and found a nice-looking place, where we were at first slightly overwhelmed by the many choices required: Beans or peas? – If peas, mushy or garden? – Luckily we did thoroughly enjoy the meal we eventually managed to order. As is usual in seaside towns, many seagulls were around, although here they were relatively harmless, and did not attempt to steal our food. T. didn’t seem to be familiar with seagulls, which might appear strange for someone who has been living on an island for some years. It is explained by the fact that he is from the south of Germany, where the seaside is far away and people tend to prefer mountains anyway. 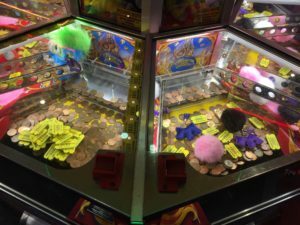 I am a big fan of these ever since I first encountered them on a school trip to Clacton-on-Sea – which in retrospect strikes me as a strange place to go to for a school in the West of Germany – where I spent quite a lot of time and money in the local arcade. (If you are not familiar with these machines, this clip can give you an idea). Since then I have learned a lot, and as far as I can see the crucial trick needed to win is not to put in one coin slowly after the other, but to insert a couple of coins in quick bursts. T. and I applied this strategy, and it worked – although I cannot remember now what kind of prize we won exactly, and we didn’t take a picture of our triumph. Later we walked around on the beach, where it was quite busy since it was a sunny day. Having done that, we decided to drink a beer at the bar on the pier before heading back to Cambridge again, which gave the day a nice sense of closure. Full closure was not achieved, however. 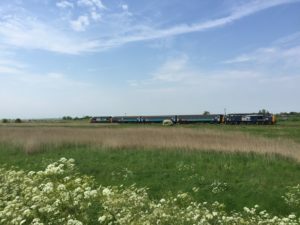 By coincidence, our train back to Norwich took the less common route via Berney Arms again, and hence I have yet to see the more standard route via Acle, which runs parallel to an unusually straight road. 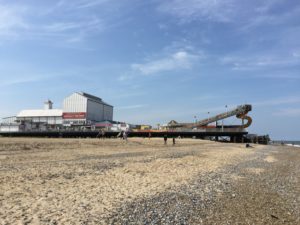 To see it I will thus have to visit Great Yarmouth again – a journey I’m looking forward to.